Go Ahead and Snicker has developed a delicious recipe indicative of summertime cooking. Orange marinated chicken is cooked on the grill and then paired with a cool soba noodle salad. 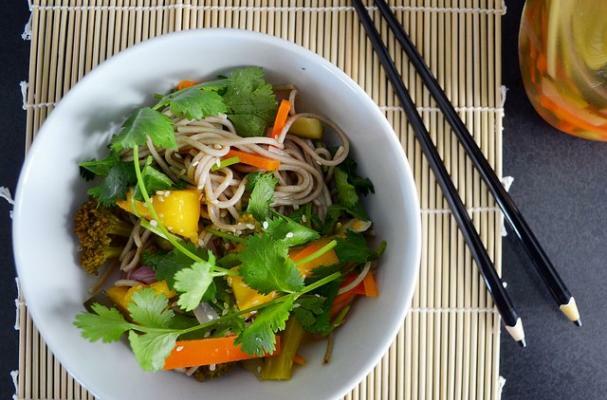 The buckwheat noodles are tossed in a sesame dressing with thinly sliced scallions and sesame seeds. This meal works for one or a crowd. Place chicken in a ziploc bag or shallow dish. Whisk remaining ingredients and pour over chicken. Marinate at least 3 hours or overnight. Cook on a preheated grill or grill pan for 3 or 4 minutes per side to cook through. Cook soba noodles in salted boiling water for 12 minutes, or until just tender. Drain, rinse with cold water and place in a large bowl. Toss with 1 Tbls. sesame oil and refrigerate. Whisk tahini, sugar, soy sauce, vinegar, sriracha, and salt and pepper to taste until combined. Add a few Tbls. of hot water if it is too thick. You'll want it to be the consistency of heavy cream. You can refrigerate this also until ready to serve, but you'll need to thin it out again with more water! When you are ready to eat, toss noodles in tahini sauce and transfer to a plate. Sounds delicious but it's hard to understand what to marinate the chicken w from your recipe. Can you be more specific? The ingredients are altogether and I can't tell what to put on the chicken vs. the soba noodles. This recipe came out horribly. What I assumed was the marinade was very good (orange, wine, etc) but the tahini sauce came out bitter with salt. Wasted a good amount of $ on ingredients that couldn't be saved even with attempting to dilute with water and peanut butter.